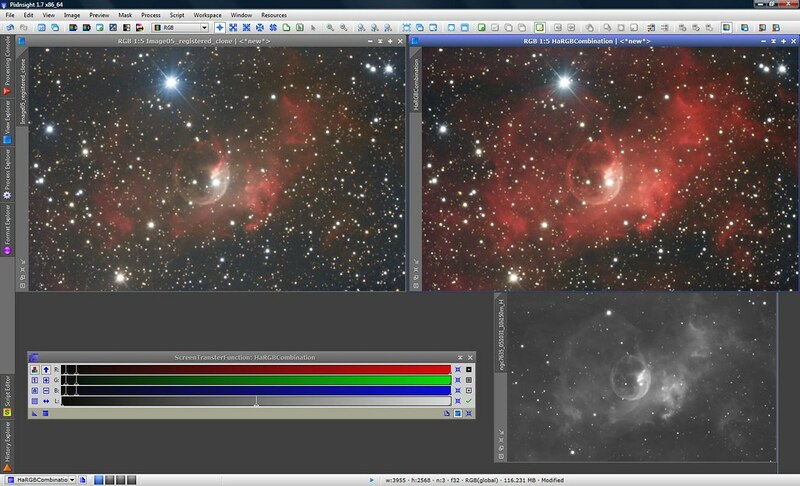 I have developed a HaRGB Combination script that I posted here: http://pixinsight.com/forum/index.php?topic=3401.0. I repost here so anybody miss it, and for your consideration. In Control Channels we choose the Ha and RGB images, the filters bandwidth and the Ha multiplication factor. You will realize that lowering the RGB Bandwidth fewer Ha passes down and viceversa, but the differences are not very evident. The multiplication factor is more important because it will increase more or less the intensity of Ha, if we have a noisy channel we can not multiply much, if there is more signal we can increase multiply factor (in Harry's example up to 4) . In Color Calibration Control we can choose whether or not to color calibrate the final image. Uncalibrated is selected by default for script to go faster. Checking Color calibration will calibrate the final image, for it, we will choose a preview of the background and a preview (or the entire RGB image) for white balance that you PREVIOUSLY defined in the RGB image. Depending on the image we choose Layers Structure detection or not. Finally, we can apply or not SCNR to green to finish calibration. Checking AutoSTF we can apply an AutoSTF when we use a linear images, otherwise we would not see anything. In the case of combining with stretched images you must uncheck it. Show Buttons. Show HaRGB and RGB buttons allow us to see the RGB and the HaRGB combination, both buttons open the console while working, do not touch the script until it closes the console and display the images, especially HaRGB Show takes a while, so don't be impatient as Pi can do strange things. I put the script in a zip. I would like to see results, and tell me if there is any fault, or if I can improve. Thank you for sharing it Silvercup. It sound very easy to use, I only need some data to try!. An outstanding work as usual. Congratulations! This script can be extremely useful for most PI users, and I can see many possibilities of further development in the short-medium term. Can we include it in the standard set? If you agree, I can release a special update to distribute it to all PI users through the update system. Do you think it is production stable, or is it still in the beta stage? 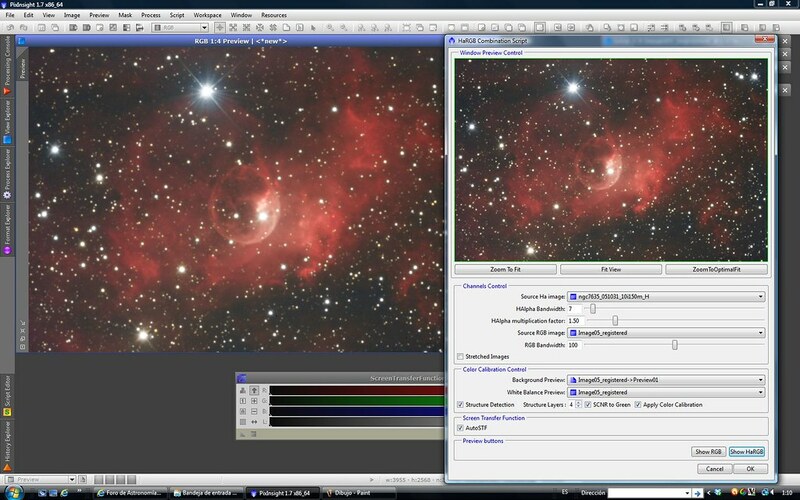 If it is stable we should distribute it through the standard repository (update.pixinsight.com); otherwise we should release it through update-devel. In both cases I can send a massive email notification. I look forward to your decision. I tried this LATE last night after I read the original post about the script. WOW. It worked great. Thanks so much. This past summer I've taken a lot of Ha data with the goal of eventually adding it to my LRGB images. Unfortunately, I just haven't had the time to study the Forum threads and videos on the various techniques. Now I have something to keep me busy this winter when the weather gets more iffy! One question. The resulting image seem to have too much in the blue channel. What's my best approach to tone it down-- Curves? Juan, I would like to see some results whit this script, and find a method to dim red channel where B and G channles have strong signal. Harry, I have resumed (again) the multichannel combination script. In this script you can mix channel the way you want. My problem is time. John, if you have too much blue, perhaps Color Calibration is not performing well. You can create any number of preview for background and white balance. So I'll try background neutralization with several previews. Take in consideration that you must select a preview of the background in the RGB but you must take care of Ha, so do not select a preview where the final image has Ha. If this fail, uncheck color calibration and calibrate manually. Take in consideration that you must select a preview of the background in the RGB but you must take care of Ha, so do not select a preview where the final image has Ha. If this fail, uncheck color calibration and calibrate manually. The best way to get the script thoroughly tested is by releasing it through update-devel. Can I proceed? Great script, thanks! It worked a treat with my widefield of the Tarantula nebula area. Take in consideration that you must select a preview of the background in the RGB but you must take care of Ha, so do not select a preview where the final image has Ha. That did the trick. Thanks, Silvercup. Also, I seem to get better results by running the script on linear images, and not stretched-- which I had tried initially. thanks for sharing! I tried ti integrate it in PI but it tells me something like error lin 83 or so?